The Detroit GMB Branch Monthly Meeting will be held on June 28th 2016 from 7:00 PM ET to 8:30 PM ET, with dues collection beginning at 6:30 PM ET. It will be held at St. Peter's Episcopal Church, 1950 Trumbull, Detroit MI, on the corner of Michigan Ave. and Trumbull. The meeting will be in the kitchen, enter through the red door off of the parking lot. Sunday in the Park on May 28th will begin what is called the Summer Holidays. It seems like Spring has just started, but non the less, here we go. The warmer months have most of the same needs as any other time. It also brings more people out to the park. Food and clothing are always needed, men and women's hygiene items are also in demand. Spread the word among your friends and in your work places about the hygiene needs, most times people are willing to give from what they have to share. We can sort them out and repackage them for the next time. Bedding and sheets are also needed for those that are being placed in housing. They have just enough sometimes for the rent and little for anything else. I'm just putting this out there, because people have been asking me for some of these things. Ready or not for the Summer Holiday, because here we go. FUJ supporters rally near Whole Foods on May 1, 2016. 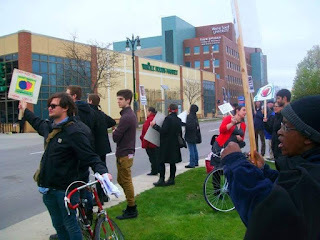 Local wobblies and other supporters of Washington berry pickers spent a lot of Sundays in 2015-16 standing in front of Detroit’s Whole Foods informing customers about an ongoing boycott of Driscoll's Berries. We’re happy to say that this work, combined with the efforts of the pickers themselves and similar solidarity actions across the U.S., helped Familias Unidas por la Justicia (FUJ), which represents berry workers at Sakuma Bros. Farms in Skagit and Whatcom County, Washington, get union recognition last September. FUJ is currently in contract negotiations with Sakuma Bros and is no longer asking for a boycott. Supporters are encouraged to call Sakuma Bros.at (360) 757-6611 and voice their support for a decent union contract. That said, it's important to keep leaving those Driscoll's Berries on the shelves, as indigenous Mexican berry pickers at BerryMex farms in Baja California (which is also connected to Driscoll's brand) have asked for the boycott to continue. Herb S. Calvert was a laborer and socialist from California. He moved to Detroit in 1918 to agitate and recruit for the IWW. In late 1920, Calvert proposed that his fellow auto workers take over the Ford plant during an extended shut-down in order to make their own cars, promising that the workers would "pay for all raw material used and... in general return the plant in even better condition." 25,000 workers, mostly unable to afford a car, turned up with their lunch pails on the appointed day. WE The regular Ford employees request the use of the Ford Plant under the existing Ford Organization during the month of Jan. to make the automobiles for ourselves and families; The total cars produced to be distributed on the basis of a minimum of one car to each employee the remaining cars at the same proportionate ration as the December pay. All Ford Employees desiring to resume under these conditions show up Monday with their lunch ready for work. Fired Westland librarians are fighting union-busting. Workers at the William P. Faust Public Library of Westland went public to their employer on March 1 to announce they were joining a union. Within two days, five full-time librarians were fired. A few days later, the head of the library’s reference department gave her resignation as a gesture of solidarity with the staff. The library board has continued to stand by the library director’s decision to fire these workers since that time. 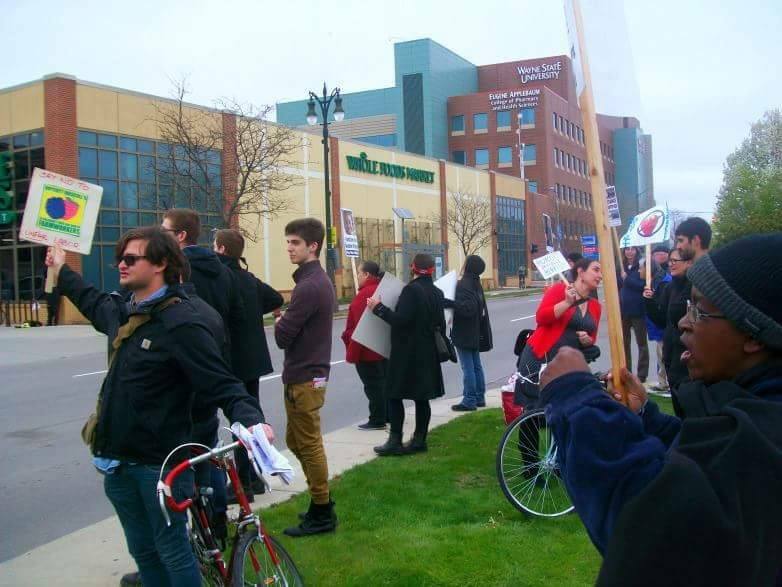 On March 29, the fired workers held a protest near the library, and 15 local wobblies showed up to offer our support. 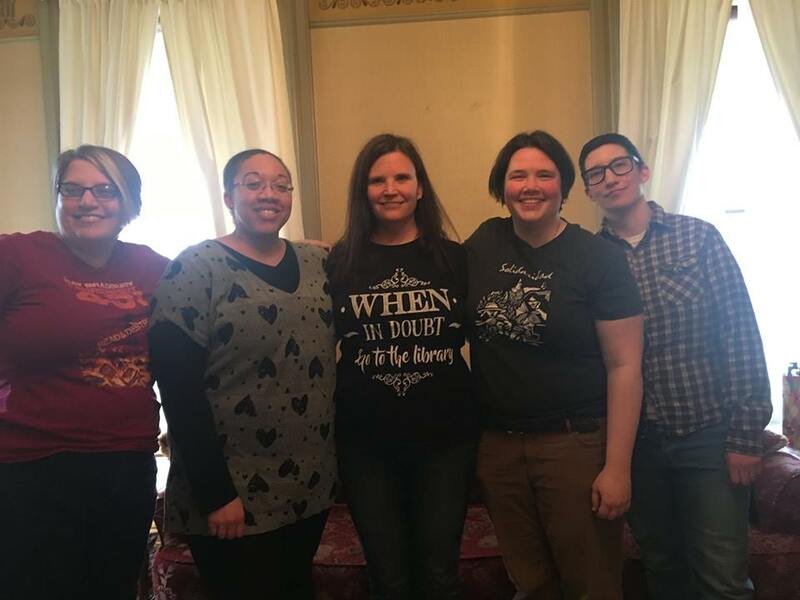 Members of the Detroit and Ypsilanti IWW branches sat in peacefully on the public discussion — and witnessed the library board again give their full support to the firings, which they rationalized by claiming it would save taxpayer’s money. In a city built on the backs of union families, their decision to bust a union is absolutely disgusting. The fired librarians and their supporters are planning another protest at the library (6123 Central City Pkwy, Westland) on May 10 from 6:15 to 8 p.m. To keep tabs on their latest activities, visit http://bit.ly/2nlzPIO or search for “Westland Librarians” on Facebook. We've got some really wonderful news to report on the local wobbly front. 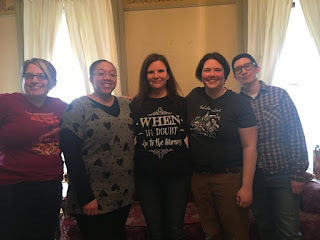 Over the past year, the Detroit GMB (General Membership Branch) has attracted so many new members in the Ypsilanti-Ann Arbor area that we recently helped them to establish their own branch. It's a triumphant return to the city for the wobblies, as Ypsilanti was once home to its own GMB and even served as the site of IWW's international headquarters from 1995 to 1999. Welcome to the struggle Ypsilanti GMB, we're excited to have you working alongside us! This May Day, the Detroit IWW will be hosting an immigrant worker’s resource fair with United Hispanic Workers of Detroit, a local organization led by Hispanic and Latino workers. The event will take place Monday, May 1, from 6-8:30 p.m. at Cesar Chavez Academy (8118 W. Vernor, Detroit) and will feature food, entertainment and know-your-rights workshops for immigrants. The Detroit IWW also encourages our readers to show solidarity with immigrants by attending a May Day rally at Clark Park that day from 4:30-6 p.m. Following up on the April 2 interfaith march between Southwest Detroit and Dearborn, the rally aims to bring people together to stand up against the repressive anti-immigrant policies of the Trump administration. No Ban! No Wall! No Raids! No Deportations! Build Bridges, Not Walls! The library's board of directors has still not removed the library director, Sheila Collins who terminated 5 librarians just 2 days after they turned in union papers. These librarians were originally budgeted for by the 10 year 2012 millage that passed by 71% and the library currently has a $2.5+ million fund balance. They were replaced by 3 part-time "library associates" (with no health benefits) who have the exact same credentials (master's degrees in library science), but none of them were allowed to apply for these demoted positions. The library board has also consistently refused to answer many citizen questions regarding these terminations. Mark Neal and Antoinette Martin have shown nothing but full support of the library director despite the overwheming evidence we have brought before them regarding her incompetence and inability to assess the library's staffing needs. Bob Johnson has told us that he does not believe the librarians should have been terminated and he thinks the director should resign. Delano Hornbuckle has said some things suggesting possible support, but his position is still ambiguous. Protest at 5:15pm and Board Meeting at 6:00pm. EMUFT will be hosting a rally for a fair contract! Come join them! They will be meeting on campus behind Welch Hall by the Cesar Chavez fountain. EMUFT will have a social after the rally at the AAUP office (901 Washtenaw Ave, Ypsilanti, MI 48197). It is across from the rally site. Food and soft drinks will be served. Today, the workers of Grassroots Campaigns in Ann Arbor announced publicly their intent to form a union. The following is a statement from the workers of Grassroots. Solidarity forever! "We, the workers of Grassroots Campaigns, have gathered here today to publicly announce our intent to form a union. The organizational goals of the causes we champion here are fully in line with this intent. We, as workers, believe in the cause FOR which we work, but the conditions OF our work have to change. Our pay is unpredictable and unreliable. We have a bonus structure but no one can seem to satisfactorily explain how it works. We have no healthcare, no benefits, but we raise money for causes that seek to raise awareness around these and similar issues! The workers here rely on steady and predictable pay and on a steady and predictable job. One worker has already been fired. As we stick together through this fight, we want to ensure that doesn't happen to other workers. All workers, upon getting hired, should clearly understand the terms and conditions of their employment. However, this is simply not the case. We are all constantly on edge about the status of our employment, as the status of our job has never been clearly defined! We have no human resources department on-site, we are often required to do work we are not compensated for, and the list goes on. All we are asking for is treatment and pay that is in line with the progressive values Grassroots Campaigns stands for. We workers know our rights! It is our right to collectively form together and bargain for better conditions instead of begging! This shop cannot close and will not close because of our union, we already make minimum wage so the only thing we have left to lose is our chains! We will not be bullied or lied to about what a union is and isn't. A union is a worker's best tool for success. It is a means of meeting our employer on level ground. It is a vehicle to ensure workers are looked after. It is not an 'outside entity.' We are the union. It isn't some pay-to-play scheme. The union has already stepped in once to help a worker that was left adrift by the company and we intend to continue representing all workers." Mother's Day in Cass Park over the years has been one of those special days. Both for the Women around the park and the Women who have been there with us. There is that special appreciation from the Mothers around the park who may not ha. Like any holiday when you are away from the ones you love, you can at least be reminded that someone cares by friends that you are remembered on that special day. The Women who help on the line have their own memories of their Mothers who were there with them and are no longer in this life, but return with their children by their side. It will be a good day with all the same other needs for a good meal, some clothing, the needed things and a good dose of friendship.